The end of the year is almost upon us, and just as yesterday came with loads of candy, the holidays will keep coming, and with them, a never-ending supply of yummy food! It is understandable to have some anxiety with the holidays; big family gatherings, planning, financial stress – but if you stick to your goals and plan your food, you can keep your food stress to a minimum. Yummy food doesn’t have to be unhealthy and you can definitely enjoy healthy food – with no guilt or anxiety attached! Since there is so much food talk in November, it’s no surprise November is National Diabetes Awareness Month, specifically because type 2 diabetes is on the rise. 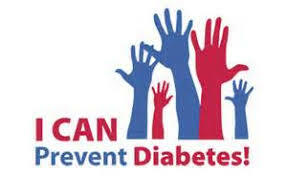 Diabetes is one of the leading causes of disability and death in the United States. One in 10 Americans have diabetes — that’s more than 30 million people. And another 84 million adults in the United States are at high risk of developing type 2 diabetes. You can learn more about type 1 and type 2 diabetes on the American Diabetes Association website by clicking here. Did you know that November 16th is National Fast Food Day? Around here we think of fast food as something that is quick to make, provides a PC combo (if you don’t know what a PC combo is, check out my books by clicking here) and gets you out the door and on with your day – without having to stop at the traditional fast food places. For a great fast recipe try my Pumpkin Pie Cottage Cheese. Side note: Have you ever been to a holiday party or a Thanksgiving gathering where everyone brings pumpkin pie for dessert? If you are wanting a different take on pumpkin pie, or wanting a faster alternative, you could also bring this instead. And, depending on the ingredients you use (read your labels), this is a great gluten free alternative! Step 1 – Combine all ingredients in a medium bowl. Step 2 – Mix well. Step 3 – Sprinkle with cinnamon and enjoy. After a big meal like Thanksgiving, you want to eat something pure, healthy and fresh so you can sort of recover as you venture out into the cold and shop your heart out (is this just me 😉 ?). And there’s still no better feel-good meal than a homemade soup to warm you up. This recipe is low in fat and high in nutrients, perfect for detoxing from a food hangover. Add some toasted sourdough bread for the perfect PC Combo. What is also perfect about this recipe, is that you can use your leftover turkey! What’s not to love about that?